What is Inflatable SUP Paddle Boards. HomeBoatsToGo - Blog About Inflatable Boats, Inflatable Rafts, Inflatable Kayaks And More...What is Inflatable SUP Paddle Boards. A growing popular ocean craze is a “SUP” or Stand Up Paddle boarding. It offers a full body/core work but can also be used for a leisurely paddle as well. SUPs take a small amount of practice to but are relatively easy to learn. Many people enjoy using their SUP as a upper body workout or daily exercise technique. WHY A PRIVATE SUP LESSON? Most people teach themselves how to use a SUP, however almost every beach offers some form of instruction or instructors on how to use them correctly. If you want everyone in your party to have an enjoyable experience it is recommended that everyone is familiar with using a stand up paddle board. There are endless locations and places you can take your SUPs, the adventure is limitless. WHICH SUP IS RIGHT FOR ME? 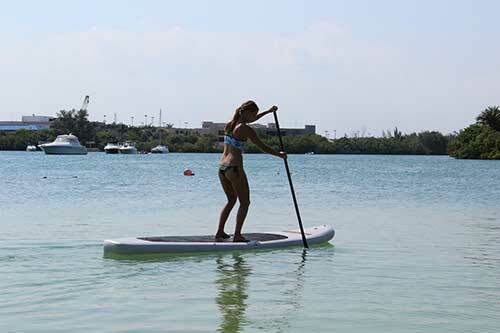 There are many different sizes and shapes of stand up paddle boards. Most average size people will find almost any paddle board sufficient for their needs. Having your own SUP is often more desirable then renting, as you may find yourself more comfortable with your own equipment.